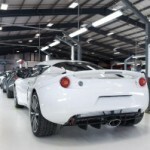 While we eagerly await the arrival of the new Exige S, Lotus have given a little teaser of what’s to come as the offer a sneak peak at the end of the factories production line. 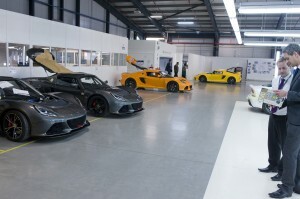 In the picture we can see a trio of LHD, roll-cage equipped, Exige V6 Cup cars (two grey and one orange) destined for the Lotus Cup US race series, while the yellow and white cars in the background are standard Exige S models likely destined for Europe or Asia. An Exige S Roadster sneaks in behind James Haskey who sneaks in with this months Evo, where the Exige S came out joint winner of the coveted ECOTY title. Dealer demo cars are reported as being mid-build at present, and still on target for delivery before the end of the month. 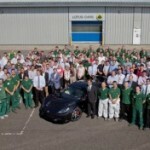 This entry was posted in Group Lotus and tagged Exige S, Exige V6, Exige V6 Cup, Factory, Hethel, Photos, Production. Bookmark the permalink.